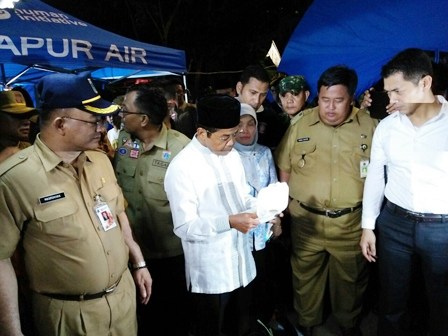 Social Minister, Idrus Marham visited Pondok Bambu fire victims' shelter at East Flood Canal (KBT) area, East Jakarta. Aid wa s distributed to lighten victims' burden who lost their houses.
" When fire disaster happened, central government and City are directly handle it"
Together with Jakarta Social Dept. Head, Masrokhan, Idrus greeted the victims and gave some stuffs with total value Rp 256,146,670. He said, it becomes government's duty to tackle disasters. Thus together with Jakarta Government, Social Ministry gives aid to fulfill the needs of fire victims in Pondok Bambu, Duren Sawit Sub-district and Cipinang Muara, Jatinegara Sub-district. "When fire disaster happened, central government and City are directly handle it," he mentioned. Social Ministry gives 29 school bags and 55 school uniforms. Then 100 blankets, 70 tarpaulins, 16 packages of special needs such as diapers, sanitary napkin, and others. Besides, there are also 16 packages of children needs, 62 packages of family kids, 240 food packages, 90 clothes packages, and 100 children clothes. Social Dept. Head, Masrokhan added, Jakarta Government also gives aid for the victims. Such as four tents and public kitchen with 50 Taruna Siaga Bencana (Tagana) personnel who handle it. Then, 55 school uniforms, five food cartons, 80 blankets, 30 tarpaulins, 30 clothing packages, 12 packages for elderly needs, 20 packages for children needs, 20 packages for disabled people, 12 family kit packages, 12 kid ware packages, and 12 food ware packages. "According to procedure, this shelter tent is available for three days. But it is able to extend the time based on urban village request," he stated.